The dangers of passive smoking are now well understood in humans. And those dangers are worst of all in those who cannot evade it. And whilst smoking in enclosed public spaces is now illegal, smoking in the home still occurs, and children continue to be exposed to it. The same threat exists to our pets, including rabbits, if they share that airspace. When owners smoke, they expose their pets to over 4,000 different toxins including 40 known cancer-causing substances and carbon monoxide. Only 15% of cigarette smoke is actually inhaled by the smoker – the rest ends up in the air exposing people and pets to the dangers of passive smoking. Obviously, pets, including houserabbits, inhale the toxic air. However, they potentially absorb dangerous chemicals through the mouth and gut when they groom themselves because the toxins land on their fur. To these we can also add the potential for skin, mouth or gut irritation from residues collecting on the coat. In addition, I am always asked about inhaled allergens in rabbits, and the idea of ‘hay fever’ or asthma occurring, and this article is a good point to discuss it. Houserabbits with little or no access to fresh air are likely to be at greater risk from effects on the airways and lungs, and associated illness through passive smoking, than outdoor rabbits. This is simply because of limited fresh air. The potent mix of irritant and toxic chemicals in inhaled air full of cigarette smoke can irritate and inflame any part of the respiratory tract from the nose to the furthermost point in the lungs (the alveoli, where oxygen is taken up into the bloodstream). At the nose end, this may cause upsetting but not life-threatening sneezing. At the alveoli end it may seriously affect the rabbit’s ability to take up oxygen and get rid of waste carbon dioxide. And in the middle, it can irritate the airways. This can cause severe difficulty breathing, and can, by damaging the lining of the airways, impair the rabbit’s natural defences against infection. Given the high incidence of bacterial infection in rabbit respiratory tracts, they need all their defences intact! Secondary Pasteurella or other bacteria may cause pneumonia or other bacterial infections. 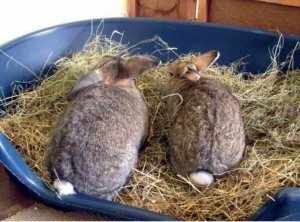 Similar problems occur in hutch rabbits due to irritation to the airways from dusty or resinous bedding and ammonia from their urine. The tiny hairs that help waft mucus and foreign material up and out of the lungs can be killed by tobacco smoke and ammonia. The mucus layer which exists to protect the airways can become thick, less easily moved out, and prone to accumulating, affecting oxygen uptake. These effects are due to the other chemicals present in cigarettes, not the nicotine, and therefore should not be an issue with e-cigarettes. However, the latter often have assorted flavourings and scents present, and those may be potentially irritant. Similar problems may potentially occur with air fresheners, incense, or other environmental contamination. It’s probably worth mentioning that birds are exquisitely sensitive to inhaled chemicals (hence canaries in the coal mine! ), and can die rapidly from exposure to a number of household chemicals. Rabbits are not as potentially sensitive to such things. One paper (Torok et al, 2000) showed that passive smoking affected the ability of rabbit arteries to relax, which, particularly in conjunction with thickening of arteries, could be fatal. 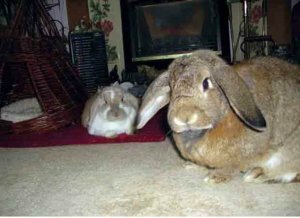 Rabbits with kidney failure may develop stiff, thickened arteries as a result of calcium being laid down in their walls, and the extra effects of the smoke could tip them over the edge. This effect is mainly due to nicotine, as opposed to the assorted other chemicals present, and is therefore an issue in the use of e-cigarettes. Studies have been carried out in America on birds, dogs and cats where it was found that all three are susceptible to cancers. Rod Straw, a pet oncology (cancer) expert from the University of Queensland, said an earlier study had found that passive smoking could be linked to lung cancer in dogs. 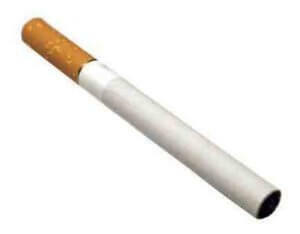 “It is interesting that they have found this link and it could be a good impetus for people not to smoke,” he said. Although no specific work has been carried out on rabbits (other than as a laboratory model) passive smoking has been proved to affect birds, dogs and cats and there is no reason why houserabbits should not also suffer the consequences of their owners’ habits. The generally greater life expectancy of large parrots, cats, and some dogs means that rabbits are perhaps at less risk of this, and the main cause of lung cancers in rabbits is the secondary spread from uterine tumours in unneutered females. As Judith Brown said on behalf of the RWAF in 2006, “Smokers need to be made aware that passive smoking is as dangerous to pets as it is to people. 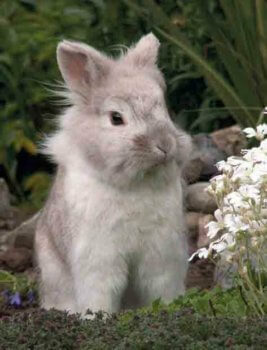 By not exposing rabbits to the dangers of passive smoking, owners can insure that they keep vets bills down. Not to mention that it makes for a happier rabbit.” Whilst I can’t better that comment, there is one additional subject that has arisen since 2006, and that is “vaping” or e-cigarettes. Whilst these are possibly better than cigarettes for human health, and their ‘cleaner’ content means that many harmful chemicals are absent from e-cigarettes, they still contain nicotine, which has effects on the heart. In addition, one e-cigarette unit contains the equivalent amount of nicotine to more than a whole packet of traditional cigarettes. This is only a problem if an inquisitive rabbit decides to chew one and ingest some of the liquid, but it would be VERY wise to keep them out of the range of rabbits, as there have been deaths in dogs from this situation. 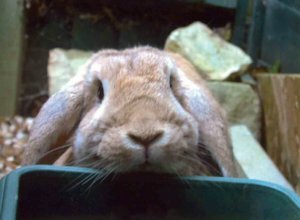 Whilst on the general topic of respiratory health, we vets often get queries about the possibility of a rabbit having allergic respiratory tract disease: ‘hay fever’ or asthma, for example. This is not impossible, of course, and we see the occasional lower respiratory allergic disease, similar to human or other animal ‘asthma’. Upper respiratory allergic disease appears extremely unusual indeed, and it is far more likely that any problem with nasal discharge or sneezing is due to infection in the nasal cavity/sinuses (although there is some debate about the exact anatomical distinctions here). ‘Hay fever’ is such an unfortunate term, as it can lead to rabbits being inappropriately deprived of hay in the belief that they may react to it badly. Whilst there are some rabbits who struggle to eat hay due to dental issues, there is no other justification for not providing ample, good quality hay at all times. Any problems with hay and the respiratory tract are more likely to be due to moulds and dust present in poor quality hays than to allergies. Passive smoking impairs endothelium-dependent relaxation of isolated rabbit arteries. Török J,Gvozdjáková A, Kucharská J, Balazovjech I, Kyselá S, Simko F, Gvozdják J.